Hi well this week the challenge with Whimsy is Make it pop. To me you can either make it pop up or just make your image stand out, you know pop. I did both for this card. I thought that I would do something in honor of summer, the weather here has been really nice. Just makes me get very excited for the great temperatures, barbeques, going for walks with my dogs and well the beach or the lake. This adorable image is called Beach Babe by Crissy from Whimsy Stamps. I love it, I made the image pop using the bright pail and shovel colors. I thought I would use some different colors with this card, I think the purple and green go well together. Well you should check out the other DT's cards at the Whimsy inspires blog and enter a card for a chance to win some free digis. They are great and very easy to use, I hope to see your card on this weeks challenge. If not then I'm really glad you decided to pop by my blog. I hope you'll come back and visit soon. Thanks for stopping by, have a super wonderful day. 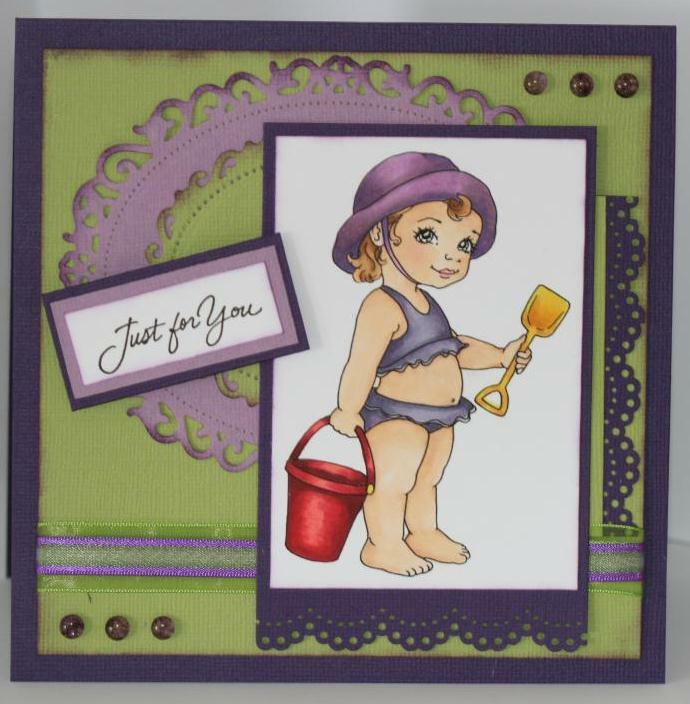 Supplies: Beach Babe digi image from Whimsy, copic markers, Bazzill cardstock, Spellbinders, Border punch, ribbon, Robin's egg beads. Luv it awesome, very cute, love the colors....awesome job!